UNIVERSITY PARK, PA. — Former Lakers legend and NBA Hall of Famer, Magic Johnson, was the keynote speaker on April 1, 2015 at the 2015 finale of both the Schreyer Honors College’s Shaping the Future Summit and the Student Programming Association’s Distinguished Speaker Series. Source: The Daily Collegian. As a former point guard for the LA Lakers, Magic led the Lakers to five NBA titles, was part of the Olympic Dream Team in 1992 and was inducted into the Basketball HOF in 2002. He is currently the chairman and CEO of both Magic Johnson Enterprises, which provides quality products and services to urban communities, as well as the Magic Johnson Foundation , which teaches and promotes education and awareness of HIV/AIDS. Johnson was diagnosed with HIV in 1991. In 2006, ESPN rated Johnson the greatest point guard of all time. 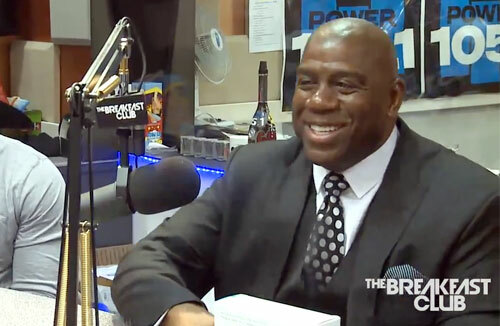 Watch Magic Johnson speaking with The Breakfast Club Power 105.1 in Feb. 2014.